How do you make a more meaningful Christmas when all you are doing is rushing and stressing trying to get things done? I am convinced that the Christmas rush doesn’t have to be what it is for many of you. Often you just need to cut back on all that you do. I know that I have encouraged you to start your day off with Jesus many times before. Even during Christmas. I will be the first to say that with kids in the home it can easily be the first thing that is neglected. Yet, when you spend even ten minutes with Jesus, your perspective on everything will be so much better! To equip you in that I have put together a journaling workbook called, Making A More Meaningful Christmas that I hope will bless you during this season. You can use it to journal about these 14 passages and the 12 Nativity Scripture Memory Cards included in this workbook. 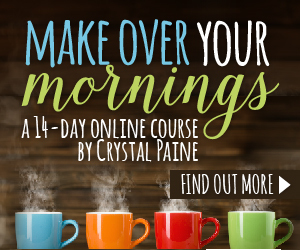 This workbook will give you the tools to enable you to start each day with Jesus. There were years when we were flat broke and we handcrafted Christmas presents for our kids and extended family. Homemade gifts are memorable but involve a lot of time. If you can’t afford the time for handcrafted gifts or your budget is too high on store-bought gifts, it would be better to re-evaluate the time or money you expend in order to make a more memorable Christmas. Here are some ideas to get you thinking of ways to simplify your Christmas plans. When your schedule is stretched because of all the things you fill it with, your Christmas will not be as meaningful. Choose which activities to be involved in and which ones to not participate in. You CAN say NO! Send out a Facebook Christmas greeting and either skip on the Christmas cards entirely or send only a few. What tradition stresses you? Skip on it this year! Once you have cleared a few things from your schedule it is time to simply sit and spend time on reflection. I am doing things constantly and this idea of taking time for reflection is as much for me as for you! Do you have a fireplace, woodstove, coal stove, or how about a candle? We had a wood stove for years and now burn coal. It is relaxing to sit and watch the fire burn. If I am in the kitchen, I love burning a candle in a glass jar. One of the things we do NOT do in our culture today is STOP and reflect. Just SLOW down and think. If you don’t want to just sit and do absolutely nothing but find this idea intriguing, here are a few ways you can do it. Of course, put on some Christmas music and put the littles down for a nap! Crochet or knit in front of the fire! Coloring in a Christian adult coloring book! Do some creative journaling art in your Bible! Spend time with Jesus meditating on the Bible verses from Making A More Meaningful Christmas workbook. Take time this Christmas to soak in the moments with your husband and children. Don’t shut them out because you become too exhausted from all there was to do. Making a more meaningful Christmas is about unplugging and living in the moment with Jesus and those you love!! How are you going to make a more meaningful Christmas this year? What ideas do you have to add? Let’s keep the conversation going! Making A More Meaningful Christmas is a journaling workbook that you will love! Thank you so much Kathy. I hope you had a very meaningful Christmas.